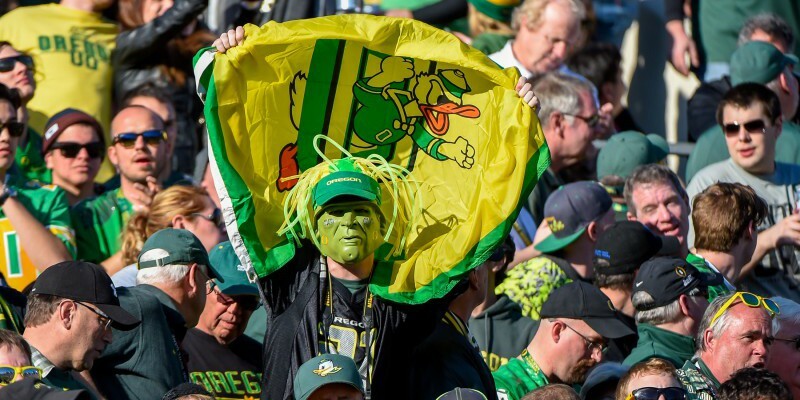 Fans, we are six days away from the biggest game of our season and our Ducks are the talk of the town… everywhere. We will face the Ohio State Buckeyes, who defeated Alabama in the Sugar Bowl to advance to the title game. I watched the Ohio State game and give them props as they played a good game. I have heard many Duck fans writing off Ohio State, saying things such as, “Oh, it’s just Ohio State… we’re gonna kill ’em.” As a loyal and loving Duck fan I can say that in the back of my mind, that is the mindset I privately have going into any game. However, the logical and sport analysis in me knows that anything can happen in any game. In an article on FoxSports.com, reporter Steven Lassan discusses the top five reasons our Ducks will defeat the Buckeyes in this National Championship game. 1. Marcus Mariota. ”When Oregon and Ohio State kick off on Jan. 12 in Arlington, Texas, Marcus Mariota will undoubtedly be the best player on the field. The junior claimed the Heisman after throwing for 4,111 yards and 40 touchdowns and adding 731 yards and 15 scores on the ground.” There’s really not much else to say there. Lassan’s No. 1 reason makes perfect sense to me! We all know Mariota is truly and undoubtedly the best. 2. Defensive Improvement. “Considering Oregon’s pace of play on offense, the Ducks are always going to struggle to rank among the nation’s best in total defense. 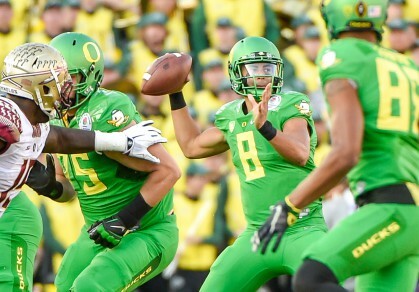 However, yardage allowed is an overrated stat for judging the effectiveness of defenses, and first-year coordinator Don Pellum has settled in over the course of the season.” Throughout the entire season people have called our Ducks defense “soft” and it’s frustrating. After what our defensive men did on the field in the Rose Bowl, I would be absolutely baffled by anyone saying such things of our defense again. Hroniss Grasu back on the field protecting Marcus Mariota. 3. Improving Health. “Oregon coach Mark Helfrich and his staff have done a nice job of navigating several critical injuries this season. Though the Ducks lost receiver Devon Allen to a significant knee injury on the opening kickoff against Florida State, this team is in much better shape in terms of health than it was earlier in the year.” It’s no secret that throughout the entire season we have had at least one valuable player out with an injury each game. In the Rose Bowl we had three of our MVPs out (Ifo Ekpre-Olomu, Pharaoh Brown, and Allen) but did we not still beat FSU into the ground? There isn’t a player on our Ducks team standing on the sidelines that isn’t going to step on that field and not give 110% for his team. However, it was evident that having center Hroniss Grasu back out there next to Jake Fisher on our offensive line was a relief. And, having Thomas Tyner back on the field was a breath of fresh air and so exciting for Duck fans to see him back out there healthy and doing his thing. 4. Winning the Turnover Battle. 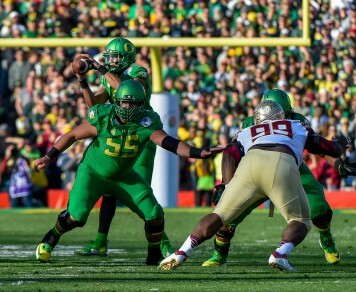 “The Ducks lost only 10 turnovers in 2014 — the fewest in the nation — and forced 30 (tied for 10th). How good (or fortunate?) has Oregon been? The Ducks were the only team in the nation to record a zero or positive margin every game this season. Ohio State, meanwhile, lost 22 turnovers in 14 games but has a +10 overall margin.” I’m sorry… what were they saying about our “soft” defense again? Thirty forced turnovers?! That’s all I have to say about that. 5. Skill Talent. “Few teams in the nation that can rival Oregon’s depth and overall talent at the skill positions. Freshman running back Royce Freeman became the workhorse for the ground game, recording 1,343 yards and 18 touchdowns on 242 attempts. 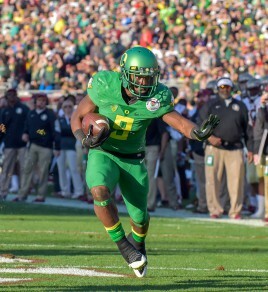 Freeman’s 18 rushing scores led the Pac-12, and he recorded three 100-yard efforts over the final four games. Tyner’s return will help take some of the workload off Freeman’s shoulders, and the Ducks can use all-purpose threat Byron Marshall on the ground (7.5 yards per carry) when needed.” Lassan goes on to point out that Keanon Lowe, Dwayne Stanford, Evan Baylis and Charles Nelson are all key skills players that Ohio State will need to watch out for. Going into this game, I am confident in our Ducks to come out with a win. I’m not saying I know our Ducks are going to win because Ohio State is going to play like they have nothing to lose (because they don’t), but I am extremely confident in our Ducks dominating the field come Monday, January 12.